"Postcard - Burying The Dead - After the Battle of Fredericksburg - Early 1900s. " 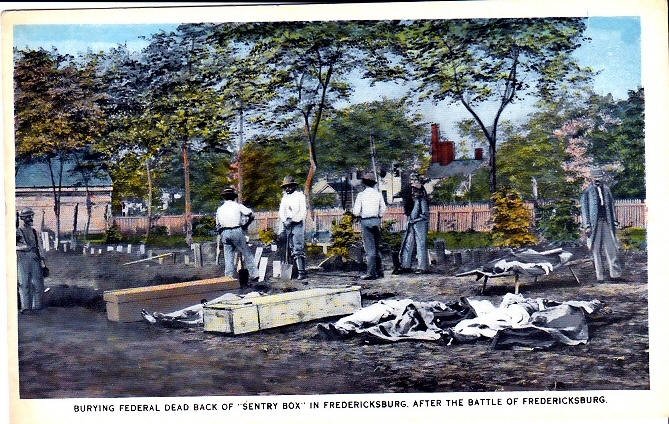 (1911) Postcard - Burying The Dead - After the Battle of Fredericksburg - Early 1900s. -Condition: Very Good Picture of soldiers digging graves with caskets and bodies, all the results of the Battle of Fredericsburg in the Civil War. This card was done by R. A. Kishpaugh from Fredericksburg. In the early 1900's Robert Kishpaugh owned and operated Kishpaugh Stationery. Besides publishing hundreds of Fredericsburg area postcards, Kishpaugh is also known for bringing the first automobile to Fredericsburg in 1907. It was a 1907 singe cylinder Cadillac. The car broke down the same day it arrived by rail and spent over a year in the shop. Kishpaugh also published many books about the area. Price: $9.00 +shipping.